This isn’t the first time I have extolled the virtues of sourdough bread. I find great satisfaction in cultivating my own supply of fresh, wild yeast, extracted from thin air! 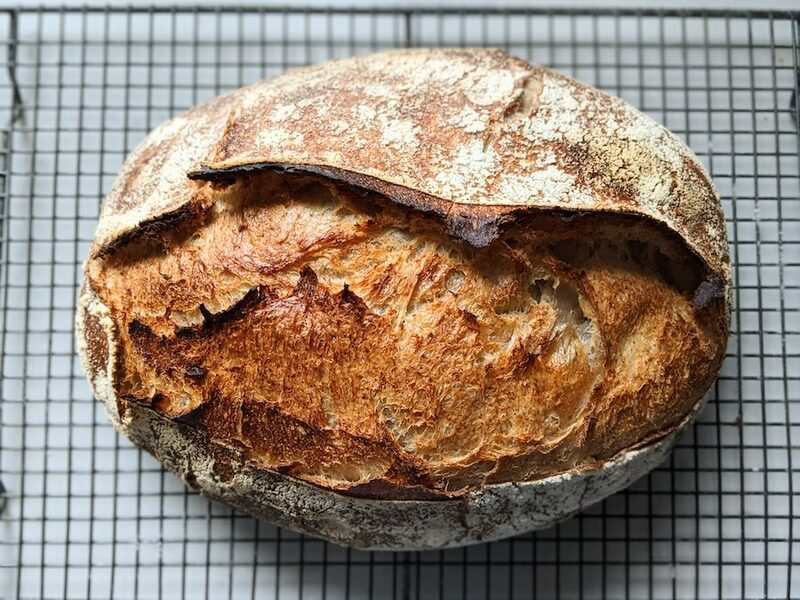 It’s a rewarding process; after feeding the sourdough every day for a week or more, the resulting product is a tangy, mature starter that will lend your bread a superior flavour and texture. The bonus is that if you use a mature sourdough starter to make your bread, you don’t have to knead it quite as much as regular bread to get a great texture because a complex gluten structure is already in place. There is one caveat to using sourdough; the leavening power of the wild yeast is not as strong as that of pure fresh or dried yeast that you buy from the shop. Because of this, I find that my pure sourdough bread is somewhat denser than my regular loaves. There’s a trade-off though; to use dried/fresh yeast instead of sourdough will give you a lighter loaf, but it also means that you won’t have the depth of flavour and texture of a sourdough loaf. After some amount of experimentation, I eventually decided to go for a hybrid loaf. This recipe uses a generous amount of sourdough starter, and supplements it with a little dried yeast to give it a lighter texture. The result is a beautifully crunchy loaf with an aerated, bubbly texture. When I make this at home, I mix the dough 1 day in advance, and prove it slowly in the fridge. This is just more convenient for me when I’m at work all day. I can come home the following evening, microwave the dough briefly to bring it up to temperature, and bake it immediately. It’s a great time saver. To create a proper crust on the loaf, you need steam. The easiest way to achieve this is to throw a cup of boiling water into the bottom of the hot oven immediately after putting the bread in. I put a roasting tray in the bottom of the oven for this purpose; unless the bottom of your oven is really clean you won’t want to throw the water directly onto it. You’ll also need a wide baking sheet or stone, and a baker’s linen or kitchen cloth to prove the bread in. Pour the sourdough starter into a large bowl. Add the flour, salt and yeast on top, and mix briefly without disturbing the sourdough underneath. Make a well in the middle of the flour mixture, and add the water and rapeseed oil. Using a sturdy wooden spoon, mix everything together thoroughly until you have a wet, sticky dough. Continue to mix for about 5 minutes. The dough should have become slightly elastic. Cover lightly with a cloth or cling film, and leave in a warm place to rise for 1 hour. Turn the dough out onto a floured work surface and pat into an approximate rectangular shape. Take the two right hand corners, stretch them outwards, then fold back in to opposite corners. Repeat this with the left side, then turn the dough over, pat into a rectangle again and repeat once more. Place the dough back in the bowl, cover and leave in the fridge overnight. In the morning, repeat the folding and stretching process from Step 3, then cover and place back in the fridge for about 8 hours. Turn the oven to 220C and put in your baking tray to get it nice and hot. Also place your roasting tray in the bottom to catch the water and create the steam. Dust your baker’s linen or a thick kitchen cloth with flour, and place on a large chopping board or tray. Take the dough from the fridge and microwave at full power for 20 seconds. Scrape the dough onto a floured surface, place back in the bowl the other way up and give it another 20 seconds. The dough will now be warmed through, and rising nicely. There should be some visible air pockets forming. If you don’t want to microwave it, simply leave it to come up to room temperature for about 2 hours. Turn onto a floured surface and pat into a wide baguette shape about 30cm x 15cm. Cut it in half lengthways to create two thinner baguettes, and place each on the floured cloth, creating a fold in the centre to separate them, and something to weigh the edges down to stop the dough from spreading out. Boil a mugful of water in the kettle. Once the oven is up to temperature, place each of the baguettes onto the tray. You’ll find this easier if you can find a thin “transfer” spatula or paddle. A piece of thick cardboard would suffice. Using a sharp knife, score the baguettes across at an angle several times, then dust with a little flour. Place in the oven, then throw the mug of boiling water into the tray at the bottom and immediately close the door. Bake for 25 minutes, then turn around and give another 5 minutes. The loaves should be hollow when tapped underneath. Place on a wire rack to cool.